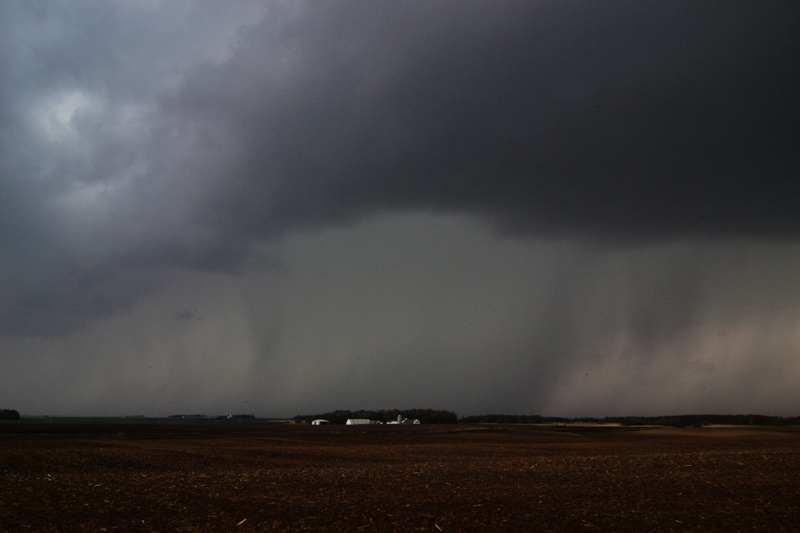 05-01-2012 CHASE LOG: MINNESOTA This chase involved an early season close-to-home setup across MN. 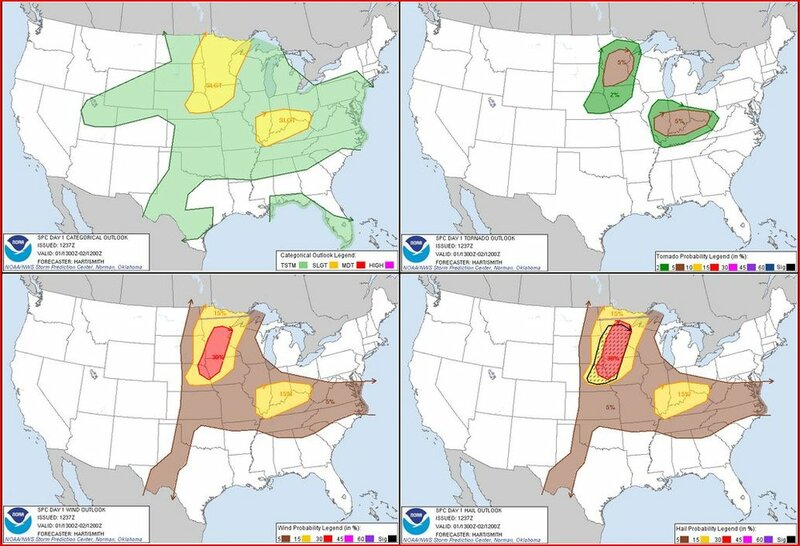 A Slight Risk for severe thunderstorms and a 5% probability for tornadoes had been issued by the Storm Prediction Center across much of the state. An upper level trough and jet streak was moving into the Dakotas as the day progressed, while an area of low pressure developed across northeast SD and a warm front lifted north into eastern SD and west-central/southwest MN. Meanwhile, a cold front was advancing through eastern SD and NE. MaryLynn and I left from my parent’s house in southern MN that morning. I was rather torn on a target area, either heading north towards the triple point that would be approaching “The Hump” area of western MN, or head towards the higher instability along the cold front near Sioux Falls, SD. We chose to angle our way up through western MN and I finally decided to go to the northern target upon reaching the New Ulm area. We opted to head for Sauk Centre, which was north of the warm front, but just east of the area I thought storms would initiate. Shortly after we arrived, a mesoscale discussion was issued by SPC, highlighting the need for a Watch to be issued from west-central MN down to northeast NE. The environment was characterized by temperatures in the mid to upper 70s just south of the warm front, dewpoints in the upper 50s to low 60s, steep lapse rates, 1000-1500 j/kg of MLCAPE, and backed low level winds along the warm front, although quickly becoming veered after the frontal passage. A Tornado Watch was issued at 3:00pm from western MN into southeast SD and northwest IA, valid until 10:00pm. Near and shortly after the watch was issued a pair of supercells developed in our area, one cell near Morris and the other I believe in the vicinity of Litchfield. We chose to go after the Morris storm, which was fast approaching the Glenwood area. As we neared the storm, it was quite intense with a lot of lightning and a well defined hail core and even a base attempting to form underneath the updraft on the southern flank of the storm. I did not think this storm was looking the best, so I wanted to get out ahead of it and head east. As we did so, I looked behind us and, low and behold, there was a funnel protruding out the front of the large, ragged base! This did end up touching down near the Sedan/Brooten area with additional spin-ups underneath the base of the storm for about 10 minutes thereafter. It was interesting because this was a broad action area and seemed to be fairly disorganized at the time. I was surprised that it produced a tornado at this point as it did not have that real good look and was fairly high based. After calling in the tornado, we continued to follow the storm through the St. Cloud area where it produced several wall clouds and transitioned into a beautiful mothership appearance just east of town near Santiago. 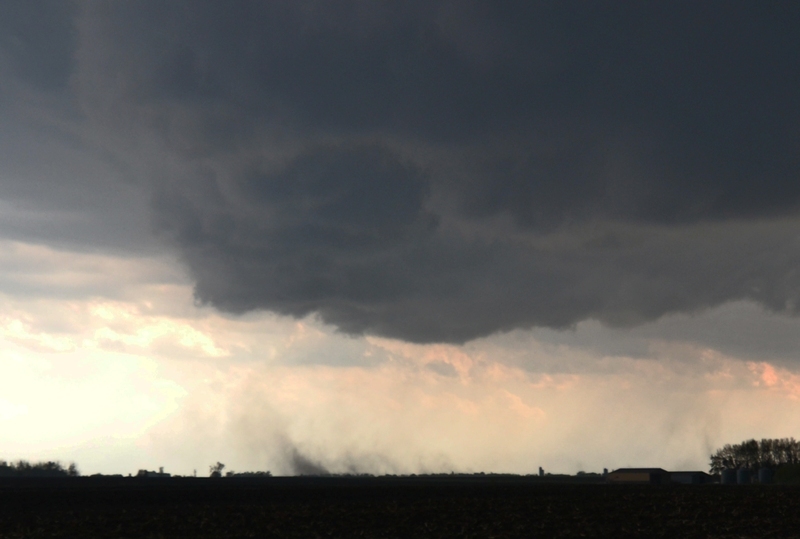 The storm had a large, rotating mesocylcone at the time and was quite photogenic, as you can see below. Shortly after the storm became more outflowish and we called it a day around 6:30pm. Lowering forming underneath the updraft base on the storm east of Glenwood, MN. Rain/hail core to the right. Intense hail core on the storm east of Glenwood, MN. Tornado touching down near Sedan, MN. Debris cloud to the left of the image. Notice no well defined wall cloud but certainly a clear slot cutting in behind this tornado. 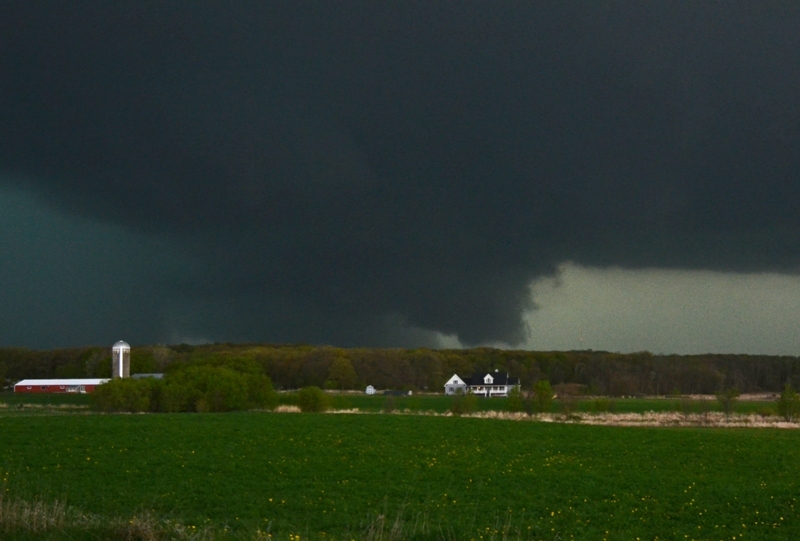 Big lowering underneath the storm and continued spin-ups occurring after the tornado near Sedan, MN. Thought at first these were gustnados, but think these may have been weak tornadoes occurring underneath the action area. More debris areas kicking up underneath the action area/broad lowering underneath the storm between Sedan and Brooten, MN. Wall cloud tightening up near St. Joseph, MN, approaching St. Cloud with the sirens blaring at the time. Awesome mothership appearance to the storm east of St. Cloud, MN near Santiago. Another view of the awesome storm near Santiago, MN with large mesocyline underneath. Kept trying to produce wall cloud looking features on the right (northern) side of this storm.